English Cardinal Basil Hume was beloved all over the world for his pastoral gifts. 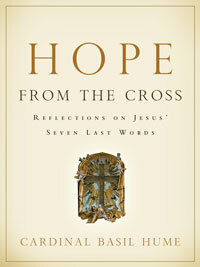 Before dying of cancer in 1999, he left these meditations on the Seven Last Words of Christ on the cross. In each one of these reflections, Cardinal Hume unwraps a gift for us-one that gives us hope even when we are in the midst of pain and difficulty. "These 'last words' . . . reveal their secrets slowly, if we meditate on them and pray," Cardinal Hume writes in the introduction. "Let those words speak to you, and I will tell you what they have said to me." • Short meditations that speak powerfully to the heart. • Can be used through Lent or at any time of the year. Available in U.S. and Canada only. "This is really not a sad book at all. In Jesus lifted upon the cross, we see the living sacrifice of himself, out of love for his Father. This is the gift of self, which is the heart of love, written large. In effect, it is a love story I commend for your prayerful reflection. "—The Most Rev. Vincent Nichols, Archbishop of Birmingham, U.K.